The degassing of lakes Nyos and Monoun was proposed independently by several scientists in the aftermath of the Nyos disaster. Klaus Tietze in Germany, and a French team, led by Adelin Villevieille (then Director of the French Delegation aux Risques Majeurs) were inspired by the gas lift technique used at the time for extracting methane from the stratified lake Kivu at Gisenyi (Ruanda). In a document issued in 1987, the Delegation aux Risques Majeurs developed a proposal extrapolating the method for off-shore oil production (see fig. 1, fig. 2, fig. 3). The scheme, including several rigs and metal pipes, was then too costly to obtain financing. The breakthrough came some years later with the choice of high density polyethylene as the material for pipes, the density of which is very close to the density of water: setting of the pipes could thus be done by hand, at a much lower cost. Feasibility of the concept was demonstrated in 1992 at Monoun, in a mission backed by UATI, and in 1995 at Nyos. The success of those trials paved the way for a fully fledged experiment at lake Nyos, to begin as of January 2001. 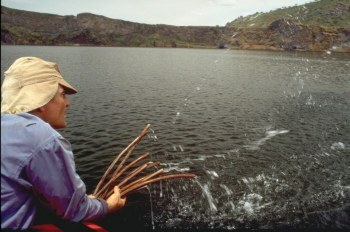 A modest self-siphon experiment was carried out at lake Nyos and Monoun in March 1990 by means of a 9 mm inner diameter PVC pipe. 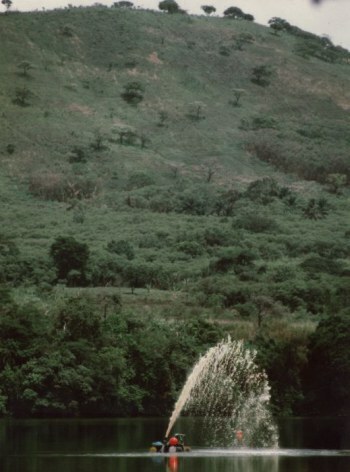 A little soda geyser (1 m high) was primed for the first time on both lakes indicating the feasibility of the controlled degassing plan. The experiment was also designed to provide Cameroonian scientists with a simple means for determining, in the field, the CO2 concentration profiles of the lakes. The self-siphon brings the gas-water mixture to the surface where the flow rate of each component is readily measured volumetrically by means of a graduated cylinder and a stopwatch (cf. figure). The results are in perfect accordance with the CO2 concentration profiles measured by other authors with less simple methods (e.g., Niskin-type water sampler). March 1990. Those results were gained using the above-mentionned method: comparison of the liquid and gas flow rates at the outlet of a small pipe self-siphon. Shown are the concentration of ex-soluble carbon dioxide; add 0.8 l STP.l-1 to obtain the total CO2 concentration. A large-scale self-siphon experiment was conducted in March April 1992 at lake Monoun, after determining an up-dated profile (fig. 1 b). Two polyethylene pipes (50 mm and 140 mm inner-diameter, respectively) were fixed between moorings on the lake bed and a floating raft, at a distance of 100 m or so from the meteorological monitoring platform set up by the US team (fig. 1 a). The main results of the experiments are presented in table. Two to three 140 mm diameter pipes (fig. 2) could readily remove in one year the carbon dioxide dissolved in Lake Monoun. A bathymetric profile of Lake Monoun. Table: experimental and calculated results corresponding to the flow in two pipes of different diameter and length. More than 90% of the energy available through gas expansion is lost by friction. The temperature drop is measured between the two openings of the pipe. The mass of the gas and the liquid contraction upon ex-solution are neglected, as is the presence of methane in dissolved gas (methane constitutes 2% of the total gas; G. W. Kling, personal communication).